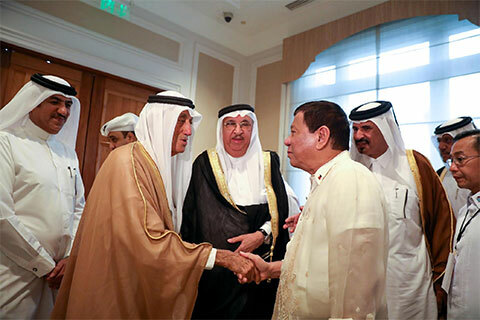 Manila: President Rodrigo Duterte witnessed the signing of 10 projects from Qatar worth $925 million, which will employ 4,650 workers at various areas in the Philippines; and two other projects of companies based in the United Arab Emirates worth $11 million, which will generate 1,070 jobs for Filipinos, sources said. Lopez said the agreements included projects in pharmagenerics, property development, medical tourism, ports, warehouses, agri-industrial ecozones, tourism and the halal industry. The new investments would generate 26,000 jobs, Abella said. Philippine ambassador to Qatar Alan Timbayan said, transcript of which reached Manila’s foreign affairs office — after Duterte’s meeting with businessmen in a forum in Qatar on Saturday. Peter Piecuch, vice president of GBC and Blackleaf Qatar Consortium, a property developer, pledged $90 million for a retirement village in Tagaytay, southern suburban Manila; also in Boracay and Cebu, central Philippines, on five to eight hectare per project. It will employ 1,250 workers, according to Director General of the Philippine Economic Zone Authority (PEZA)’s data sent to Gulf News. Michael El Jarouch, VP of First Qatar Real Estate Development Company (FQRDC), pledged $60 million for a retirement village on a 10-hectare area in Visayas, central Luzon, It will employ 1.250 workers. Two more other projects from UAE were firmed up in Qatar, PEZA said, adding that Khalfan Al Suwaidi, CEO of UAE’s Penguin Group, sealed a $10 million agro-industrial project on a 500 to 1000 hectare property in Palawan, southwest Philippines. It will employ 1,000 workers. Qatar was the last leg of Duterte’s Middle East visit. He was in Saudi Arabia from April 10 to 12; and in Bahrain from April 12 to 14.